NEW YORK, October 26, 2016: SilverRail, the technology company powering global rail with its next generation retailing and distribution platform, has partnered with Fareportal, a high-tech, high-touch travel company powering the next generation of travel. This new partnership will expand Fareportal’s offering to travellers in the US by incorporating rail options alongside flights for the first time. New York, NY and Washington, D.C.
Boston, MA and Washington, D.C.
Werner Kunz, Chief Operating Officer at Fareportal said “Rail carries as many passengers as air between some of the major US cities like Boston and New York, and so it’s a natural fit for us to offer rail options alongside air, allowing customers to comparison shop with one search on CheapOair.com”. Fareportal is a high-tech, high-touch Travel Company that powers the next generation travel concierge service. Utilising its innovative technology and company owned and operated global contact center, Fareportal has built strong industry partnerships providing access to over 450 airlines, 150,000 hotels, and hundreds of car rental companies that serve millions of customers every year. With a portfolio of consumer travel brands, including CheapOair and OneTravel, Fareportal’s airline partners can benefit from access to a broad customer base that books high-yield international travel and add-on ancillaries. SilverRail’s proprietary technology offers a simple and common digital infrastructure for rail. Our product suite spans the rail e-commerce customer experience: journey planning, inventory management, scheduling, pricing, booking, payment, ticketing, reporting and administration. The SilverCore API is the world’s first unified platform for global rail, it connects the carrier content and retailing to any distribution partner, on or offline. SilverRail is currently processing over 1 billion online rail searches per year. Over 35 providers and carriers are connected via the company’s ‘SilverCore’. More than 25 million bookings are made on SilverRail’s various systems each year. SilverRail is currently serving over 1,500 corporate customers worldwide. CheapOair is excited to be the recipient of the Top Sales Agency Award from Ethiopian Airlines for the second consecutive year. This award is given annually to recognize the top sellers of Ethiopian Airlines tickets throughout the year. 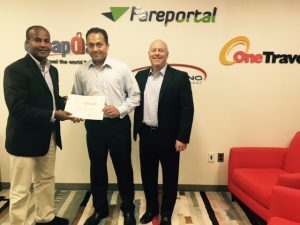 Amha Shiferaw, Traffic and Sales Manager New York for Ethiopian Airlines (left) and Gregory Onorato, Regional Sales Manager, New York for Ethiopian Airlines (right) presented Sanjay Hathiramani, SVP of Supplier Relations at Fareportal (center) with the Top Sales Agency Award at the Fareportal Headquarters in New York, NY. 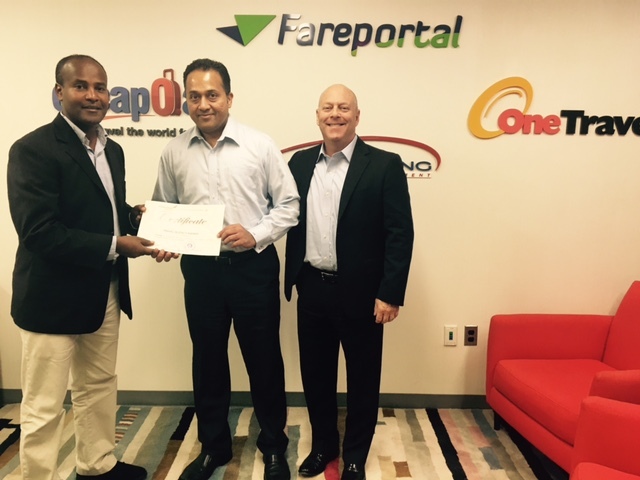 Amha Shiferaw (left) and Gregory Onorato (right) of Ethiopian Airlines present Sanjay Hathiramani of Fareportal (center) with the Top Sales Agency Award at the Fareportal Headquarters in New York, NY. NEW YORK, October 11, 2016: CheapOair, a leading flights-focused, next generation concierge travel service consisting of a traditional travel agency with a digital front end, has been awarded the Top Sales Agency Award for 2016 from Ethiopian Airlines. This award is given annually to recognize the top sellers of Ethiopian Airlines tickets throughout the year. Ethiopian Airlines operates out of four North American gateways including Los Angeles, Newark, Washington, D.C., and Toronto. CheapOair has been supporting Ethiopian Airlines’ growth in the Americas with a partnership dating back over 10 years. Airline; Ethiopian International Passenger Airline; Ethiopian Cargo; Ethiopian MRO; Ethiopian Aviation Academy; Ethiopian In-flight Catering Services; and Ethiopian Ground Service. Ethiopian is a multi-award winning airline registering an average growth of 25% in the past seven years. NEW YORK, September 27, 2016: Fareportal, a high-tech, high-touch travel company that powers a next generation travel concierge, is set to launch a co-branded credit card program with Synchrony Financial (NYSE: SYF) in October 2016. The program includes new Visa® and Visa Signature® credit cards for both CheapOair and OneTravel, as well as a private label credit card for each brand. Access to special financing for six months on qualifying purchases of $399 or more (after discounts). A $50 statement credit after making purchases of $500 or more in the first 90 days (excludes special financing purchases). Accelerated earning of CheapOair and OneTravel Rewards Program Points. Travelers around the world can find and book their perfect trip on CheapOair or OneTravel’s websites, mobile and tablet apps, and by calling one of thousands of trained travel agents in multiple countries and in multiple languages. Fareportal provides access to more than 450 airlines, 200,000 hotels and hundreds of car agencies worldwide. Fareportal is a high-tech, high-touch Travel Company that powers the next generation travel concierge. 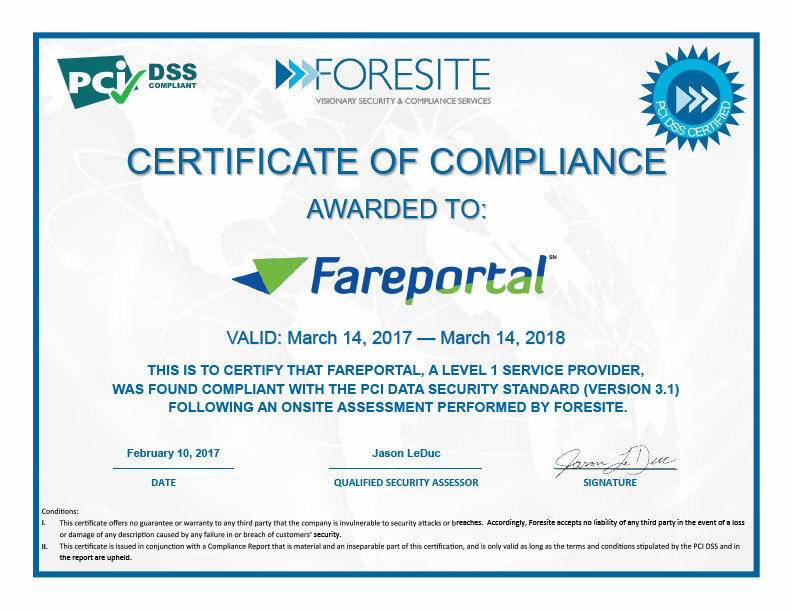 Utilizing its innovative technology and company owned and operated contact centers; Fareportal has forged strong industry partnerships providing access to over 450 airlines, 200,000 hotels, and hundreds of car rental companies that serve millions of customers every year. To learn more, visit http://www.fareportal.com/. NEW YORK, September 19, 2016: Fareportal, a high-tech, high-touch travel company that powers CheapOair, a next generation travel concierge, announced it was awarded Gold in two categories at the 2016 Travel Weekly Magellan Awards. CheapOair earned awards in the Online Travel Services category for both its website and the CheapOair app developed for iOS. “These awards recognize CheapOair as a leader in the travel industry for innovation in technology,” said Sam S. Jain, CEO at Fareportal. From design to marketing to services, The Travel Weekly Magellan Awards honor the best in travel and recognize the travel professionals behind it all. Since its beginning in 2008, the awards have been recognized among the top accolades in the travel industry.